There is nothing you can buy on a shelf that compares to homemade jam and bread! I have great memories of making bread with my mom. 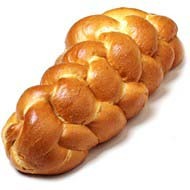 We didn't make the traditional loaf bread but Challah bread: a braided, Jewish egg bread. My father was a Messianic Jew( a Jew who believes in Jesus) and my mother was as gentile as you can get but I think she enjoyed the Jewish customs more then my dad did. Making Challah was very time consuming and labor intensive but when it came hot out of the oven, the fresh smell permeating the air, slathered with butter... it was heavenly. Now I am making memories with my children that I hope they will cherish when they get older. I have made Challah many times since my childhood, but I have gone the more traditional route now with good ol' loaf bread. I am by no means a Bread Artisan but I have learned a few things from my many attempts, failures and triumphs in bread making. Along with learning to make bread I have also added making my own jam. I never learned to make jam growing up but since becoming a strawberry picker it just seemed the natural thing to do. My husband's Grandpa who we call Great Papa, makes the best bread, seriously! He is 94 years old and he still makes bread every week! All the grandchildren and great grandchildren usually devour it as soon as he makes it. Maybe its that he has 16 great grandchildren who visit weekly, to explain why it is gone so fast. As soon as we go to his house they all ask for "Papa bread." More beautiful memories being made that I know I will cherish probably even more then they do. His wife who has gone to be with Jesus in Glory 2 years ago,who we all, especially great papa, miss terribly( they were married over 75 years!!!!).... was the jam maker. I think her strawberry jam was the first homemade jam I ever ate. Mmmm... was it good! Showing interest in making my own, she gave me some good advice to get started. I don't make it as good as hers but it still tastes good. Yes, I love making my own bread and jam just for the health benefits and the taste, but mostly I believe there is something very special about making food with love for and with your family. It connects you and creates memories that are so simple and precious. Maybe when you smell yeast rising bread in your home it reminds you of special times or fresh strawberries heating over the stove ready to be turned into something wonderful, of loved ones who have gone on before you. Some of you may not relate and when you think of making your own bread or jam you think of a hot, messy kitchen with nothing to show for it. Yes, your kitchen will get messy( especially if you let the kids help, or even if you don't have kids;) and yes, things might not always turn out as you would like( believe me) but then when you do finally get it right, the reward would not be as sweet if you didn't go through some trials and mishaps. You don't have to cook or bake at home to make memories with your loved ones, because lets face it; some of us just can not cook worth a lick, but food is something we all have in common, so why not put a little love and effort into it at least once in a while? In a world that is driven by fast convenience and a quick satisfaction don't you think your family deserves to slow down and find out about the hard work and effort that goes into making what we consume? The satisfaction and enjoyment you receive when you put your heart into something compared to picking it off a shelf and forking over money, is not to be snickered at, it is to be cherished. Don't get me wrong , there are many days I thank God I can run to the grocery store and just "pick" something out that somebody else got paid to prepare!! But when life isn't too crazy I thank God also that I have the ability and privilege to make my family food, I prepared myself and know exactly what went into. At those times it just does my heart good to know that at least once in a while my family is consuming something that not only tastes good but is good for them and maybe balances out all the other trash we stuff down our mouths. Sorry I didn't mean to go off on a tangent... I just got carried away I guess. So with out further ado I would like to share with you the bread and jam recipes that I use. I have tried many different bread recipes and gotten many different results. I have tried complicated recipes that required 3 times of rising and soaking the bread overnight to aid in better digestion, to simple recipes that went straight from the bowl to the oven. I have even tried to glean some wisdom from Great Papa and watched and took notes as he made his bread (which was very helpful)but I have learned that making bread is an art, sometimes you just have to go with your gut and throw the recipes to the wind till you find what works for you. I will try to relate as best as I can what I have found that has worked for me. Don't worry I will put it in recipe form but I encourage you as you mix, knead and pour to go with what feels best, even if its not exactly the right measurements. Basically all you need for bread is: a good yeast( I buy mine in bulk), warm water, sugar(or honey) and flour(bread flour) and butter or oil. 2. Add your butter, or oil and honey,then mix in the flour 1 cup at a time, till you get a smooth mixture. As you keep adding the flour it will start to form into a dough, you don't want it to be sticky but make sure you don't add too much flour. 3. Like I have shared before I use flour I buy in bulk from a coop www.Haleysilo.com and mill it myself in a mill, here is a helpful site to get you stated if you are interested. http://www.breadmachinedigest.com/tips/milling-your-own-flour-the-hows-and-whys.php but I also use bread flour with it. I actually like kneading the bread with my hands, I know I am crazy... and so do the little ones. 8.Let them rise till they are above the pans, make sure they do not rise to much or they will deflate when they go in the oven. If that does happen punch down the dough and make into loaves again. You can't have bread without jam, so here is how you make jam:! All you need is the sure jell, lots of sugar and strawberries or your berry of choice, and a little gumption. I know you are thinking you just got making bread under your belt and now I am asking you to try making jam! As with anything you have never tried, the thought of the unknown can be more daunting then the task, but once you dig in your heels and determine to do it, it isn't as hard as you thought. You just have to try it or you'll never know. Yes the 1st time may not always go perfectly but if you keep at it you will become and expert and everyone will think you are awesome because you make your own jam, or at least your husband. Just in case word spreads that you are making jam in your kitchen you might want to make a double batch. The Sure Jell directions will take you through the process step by step. I use the jam recipe. Just so you know I do not "can" my jam. I am just too lazy... you can figure that out if you want to. Its on my list of things to learn someday, but for now I simply make the jam and put it in the fridge and we consume it. I have never had a problem with it going bad, so I am sticking to my guns. 1. You wan't to put all the strawberries in the blender of food processor till smooth, I like to leave it a little chunky. 4. Pour into prepared jars that are clean and dry. I usually save jars all year.